MamaCITA maintains a membership of about 20 artists. Most MamaCITA members are invitational. Occasionally we entertain requests to join. It is the objective of MamaCITA members to facilitate artistic growth while encouraging a positive balance in each member’s work/life dynamic. These goals are realized through critique, support, professional development opportunities, collaboration, and the sharing of knowledge, connections, and skill sets. 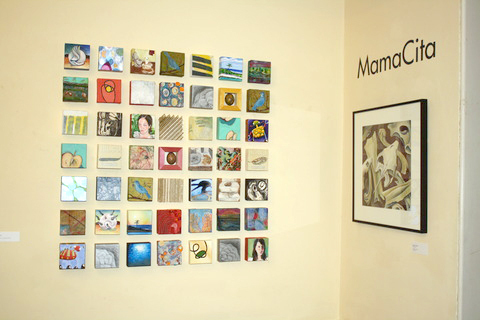 Members are encouraged to exhibit personally and collaboratively each year and to continue to seek local and national venues and grant opportunities for the collective, while adhering to the high standards of professionalism that MamaCITA is known for. MamaCITA members are expected to fully participate in the ongoing opportunities, responsibilities, and challenges of the collaborative, while continuing to strive for the creation of conceptual, visionary, activist art that addresses important and relevant issues of the day. If you are an artist, and a mother, and have an interest joining MamaCITA, please email your statement of intention, your address, a resume and samples of your work to members(at)mamacitaarts(dot)com.